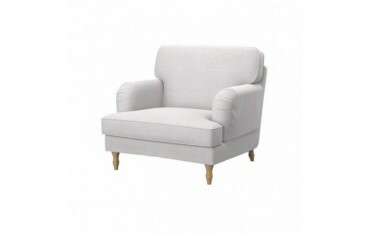 The replacement slipcover for the IKEA - STOCKSUND armchair has been designed especially to please the eye and to let you sit comfortably in your favorite piece of furniture after a hard day of work or studying. From this moment on - no longer only a soft and comfortable one, but also beautiful and changed into something, which is pleasant, cosy and good-looking. While choosing the best matching replacement slipcover for an IKEA - STOCKSUND armchair, you can choose between a lot of different colours, shades and textures of the material of which the cover was sewn. You can match your cover to the interior's design very easily. This functional decorative element has a feature of hydrophobicity, which prevents the material from soaking with water. Now when you accidentally pour your afternoon tea on the furniture, you do not have to worry - any dirt is easily removable from its surface, and if the slipcover becomes dirty, just take it off and put in your washing machine to make it clean.